Taking notice of the rapid growth in its total electricity consumption and the role of the built environment in this growth, the UAE soon realized that its current growth trends are not sustainable. The UAE’s electricity demand has doubled over the last decade from 35 billion kWh to over 70 billion kWh, which represents a hugh increase in per capita energy use when compared to a population increase of approximately 60% over the same period. The UAE’s built environment plays a major role in this growth in per capita consumption, with up to 60% of its electricity consumption used in cooling buildings during the hottest day of the year. With more inefficient buildings due to join the existing building stock in the near future, this exponential growth presents an undeniable challenge. But the UAE’s own architectural heritage may present an alternative approach to this alarming trend. Presenting a traditional precedent in cooling local indoor spaces since the 19th century, traditional design provides lessons in passive cooling that can be implemented in today’s designs. Like much of the region’s traditional urban fabric, the UAE’s traditional towns were typically clusters of inward-facing courtyard houses. These houses were connected via narrow pathways, which typically ran north to south, creating shaded areas, reducing heat gains, and benefiting from prevailing winds. This urban pattern allowed residents to walk in relative comfort even during the harsh summer months. Another prominent feature of traditional architecture is the use of wind towers. Rising above buildings’ roofs and open to all four directions, these towers provided ventilation and passive cooling by capturing wind and directing it into the interior spaces of the building through narrow shafts. Traditional buildings also benefited from high thermal mass building material, which protected the interior from increases in outside temperature and solar heat gain, making the interior easier to cool passively. However, the discovery of oil in the UAE in the 1950s, ushered a shift in building patterns in the UAE towards international-style modern designs. This shift could be attributed to a decision to accelerate nation building, a lack of local design professionals, and an influx of foreign professional who lacked an understanding of local climate and building culture. This article argues that if the UAE hopes to control its ever-increasing demand for electricity, its policy-makers should start regulating the building industry’s energy use while introducing mandatory building codes that incorporate passive cooling. Passive cooling essentially aims at naturally attaining and sustaining a cool indoor environment. It reduces the dependence on energy-intensive mechanical cooling which saves capital expenditure, reduces energy costs, and improves indoor air quality. Studies by the Abu Dhabi Urban Planning Council have demonstrated that incorporating simple and sensible passive cooling strategies into the design of the built environment can result in as much as 25% reduction in heat gain, which translates into significant savings in cooling electricity consumption. Passive cooling strategies can generally be classified into two main categories, the first of which aims at minimizing a building’s need for cooling while the second utilizes wind and heat to actually cool and ventilate its spaces. The single most sensible and simple design decision that can drastically reduce a building cooling demand and performance is its orientation. Climatic data suggest that buildings in the UAE receive the highest levels of solar heat gains on their eastern and western walls in the summer and on their southern walls in the winter. Thus, it is generally recommended that buildings are designed to be oriented on the east-west axis, with any glazing on the north and south sides complemented with appropriate shading and glare control. Microclimatic wind patterns must also be studied as they might inform a slight change of orientation to benefit from air cooling effects. Massing of buildings should also be seen in their urban context. High rise buildings of similar heights should be avoided as they limit air movement. On the other hand, combining buildings with varying heights and with long facades permits air movement, which results in better ventilation and reduced heat gains. Shading is another important aspect in the UAE considering the high heat gains experienced by its buildings. Shading can be achieved through a variety of strategies including self shading, building clustering, overhangs on windows, planting large trees, and shading features. Operable shading devices offer the flexibility of adjusting shading blades or shutters to allow ventilation and daylighting into interior spaces without admitting direct heat gain. In a typical house in the UAE, 30% of heat gain occurs through its roof and almost 30% through its walls. So another effective passive cooling technique is to provide high thermal insulation on the building envelope. By preventing heat from entering the building, any cooling attained by mechanical or natural conditioning can be retained. To reduce heat gain, high insulating building materials must be used appropriately around the building envelope. The effectiveness of insulation of certain envelope elements can be assessed using their U-value (which represents the amount of heat radiation (W) that can enter the building per meter square of areaand at a temperature deferential of one degree). Well insulated walls, roofs and floors should have a U-value of 0.35 at most. As mentioned above, traditional architecture in the UAE benefited from high thermal mass materials, which not only insulated against increases in outside temperature but also reduced solar heat gain. Heat gain through windows – which constitutes 40% of heat gain – can be controlled by reducing the ratio of glazing to the building facades and by using glazing with low Solar Heat Gain Coefficient (SHGC), which represents the ratio of heat that enters the indoor to the heat that reaches the window. The use of high performance double glazing, for example, yields a SHGC of 0.22. There are many ways in which buildings can utilize natural ventilation to provide an acceptable level of thermal comfort. Orientation is an important factor in allowing cross ventilation by providing access to predominant wind directions. But where the context do not allow cross ventilation, innovative solutions such as wind towers or solar chimneys can allow natural ventilation. For example, using solar chimneys in combination with a cooling cavity, cools outdoor air as it enters the space, while rejecting warm air through the solar chimney. A similar system was tested successfully by Professor Mohsen Aboulnaga in the city of Al Ain in 1998, where air flow rates achieved were sufficient to provide thermal comfort to occupants. Reducing air leaks through a building can also have a remarkably large impact on its cooling needs. Warm air tends to leak through poorly sealed building envelopes, which increases heat gain and the need for mechanical cooling. With this issue recently coming to the fore, greater importance is now placed on ensuring that buildings are properly pressurized and that air leakages are controlled. A target leakage rate is below 3.64 l/s/m2, a unit which represents the amount of liters of air that leaking though the building per second per square meter of area. Perhaps the most ambitious project to employ passive strategies in the UAE is the Abu Dhabi’s Masdar Institute for Science and Technology (MIST). As the first building to be constructed in Masdar City, The Masdar Institute seeks to provide a local example on how passive design can help reduce energy demand, and thus help achieve the city’s zero energy targets.The first phase of the Masdar Institute, which has been fully operational since 2010, features 6 buildings that achieved a 50% reduction in cooling demand compared to an average UAE building. To achieve this remarkable reduction in cooling demand, its designers incorporated several innovative passive design strategies, most of which were inspired by elements from traditional architecture of the Emirates. The most notable feature of these strategies is a 45m structure that provides cool breezes to the central courtyard (Figures 1,4). This contemporary reinterpretation of the traditional wind tower operates according to the same principles of the wind towers built in the Bastakia area of Dubai and elsewhere around the region, albeit in a more active manner. 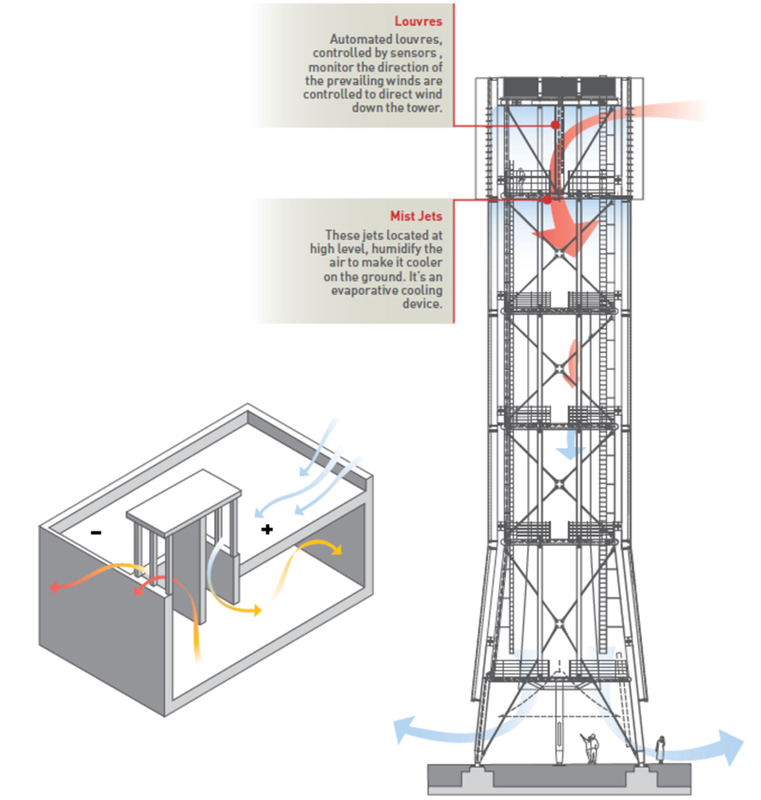 While the traditional wind towers opened to all four directions, this wind tower is equipped with sensors that will operate its top louvers to open in the direction of the current prevailing winds, thus insuring maximum efficiency. Other features of the campus design that have their roots in the traditional architectural include its narrow (6m) shaded routes and the use of high thermal mass as a storage for ‘coolth’ that is then radiated back to its surroundings when temperatures rise. 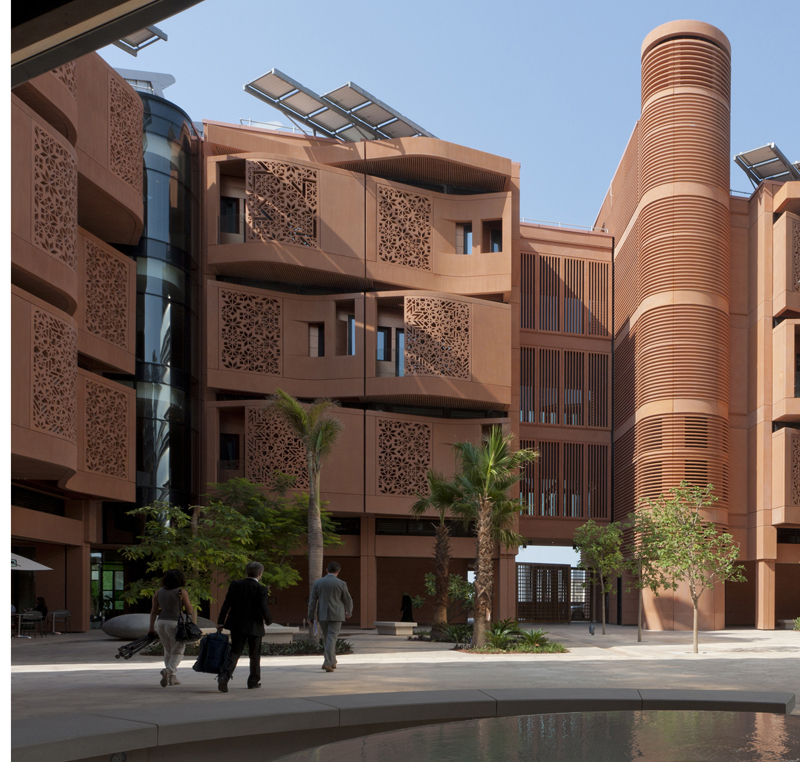 Visitors of the Masdar Institute are also drawn to the terracotta colored facades of its residential buildings (Figure 5). The wavy envelope design not only mimics the forms of desert dunes that surround the city, but its multi-layered design also serves several environmental and social functions. In addition to allowing for privacy, its outermost layer provides self shading to balconies while reducing solar heat gain in interior spaces. Its glass-reinforced concrete latticework allows for daylighting and night purge cooling, while its cantilevered design helps shade the narrow pathways below by reducing the distance between buildings further. To complement this outer layer, the envelope’s inner layer is highly reflective, highly conductive, highly insulated, and highly sealed. But Perhaps the most remarkable fact about the Masdar Institute and about Masdar’s general approach to developing their zero-carbon city is that it strives to achieve its energy targets in a commercially viable manner. By choosing cost effective technologies and features and rejecting those that are less scalable, Masdar can represent a true model for energy efficient development in the region. It also sends a clear message to the local construction industry that incorporating passive design strategies not only provide environmental and socioeconomic benefits, but that these strategies are scalable and will soon become part of mainstream practice. It is worth noting here that while Masdar is a wholly owned subsidiary of Mubadala, a government investment vehicle, it describes itself as a “commercially driven enterprise that operates to reach the broad boundaries of the renewable energy and sustainable technologies industry”. With the regional building industry currently suffering from a lack of innovation, a locally-generated sustainable architecture renaissance in the UAE might be the catalyst it needs for a revival. More importantly, it might be a trigger for the development a more sustainable built environment that would play a role in confronting the global environmental challenges that face our planet. 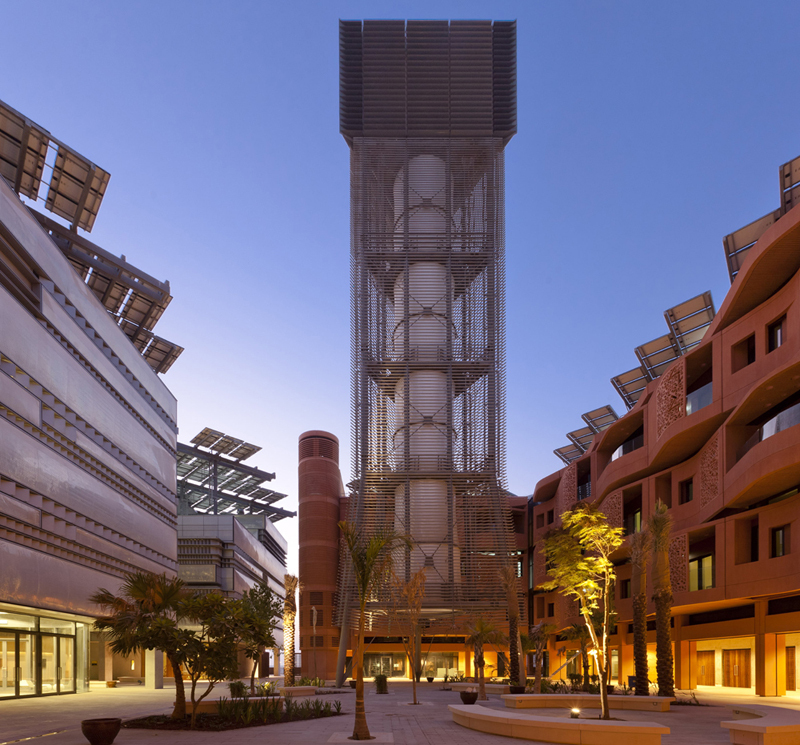 Projects such as the Masdar Institute may present an example on how this could be done.